Ich habe ein Bild aus einer Werbung genommen, Gesso darÃƒÆ’Ã‚Â¼ber gemalt und dann die Aussenlinien nachgezeichnet und innen mit Wasserfarben ausgemalt. Wat’n SpaÃƒÆ’Ã…Â¸! 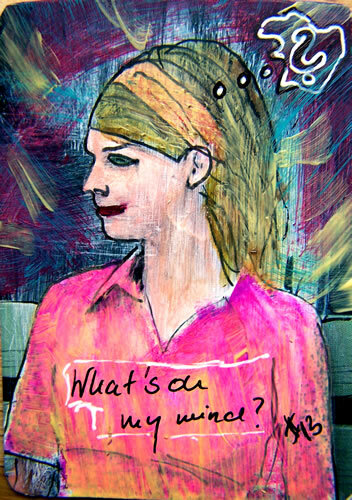 I used a magazine clipping and painted gesso over it, then traced the outerline again and painted with watercolors. Fun! 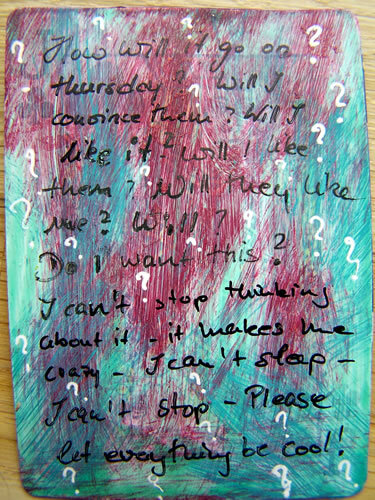 Journaling: How will it go on thursday? Will I convince them? Will I like it? Will I like them? Will they like me? Will? Do I want this? I cant stop thinking about this – it makes me crazy – I can’t sleep – I can’t stop – Please let everything be cool! Na – ich gehe mich dann mal wieder ablenken – LOL! Well – I will go and distract myself again – LOL. This is so cool! What a great technique. It looks wonderful. So… how did it go???? Great I’m sure. This is so very cool. I love what you have done here! Your card is awesome Nat!!! And tell me… did they love you? And did you love them?